Is your Whirlpool refrigerator displaying an error code? These error codes are for Whirlpool Side by Side refrigerators. The error codes can assist you with troubleshooting what part or component is causing the error. See below for ALL error codes an Whirlpool refrigerator can display. Find the reason why your Whirlpool is malfunctioning and replace the part yourself to save money. Some of these error codes MAY require the assistance of a professional appliance repair service. There are many different model numbers of Whirlpool refrigerators (side-by-side, bottom-freezers, french doors) with digital displays so when you see an error code write down what is flashing or displaying. Don’t pull the power from the fridge if it shows an error code. If you pull the power plug it will erase the fault code. NOTE: Most of the error codes below are for Whirlpool side-by-side models. Condition: The 6th Sense technology is activated – If you put warm food in the refrigerator or leave the door open, the 6th Sense technology kicks on to return the refrigerator to the set temperature. The flashing 6 should go away once it gets back to the right temperature. Check: Unplug the refrigerator and the air damper that controls air flow from the freezer compartment to the refrigerator compartment for damage. If the air damper is broken, replace it. Check: Unplug the refrigerator and reconnect the refrigerator thermistor wire harness if loose. Replace the wire harness if damaged. If the wire harness is okay, replace the refrigerator compartment thermistor. 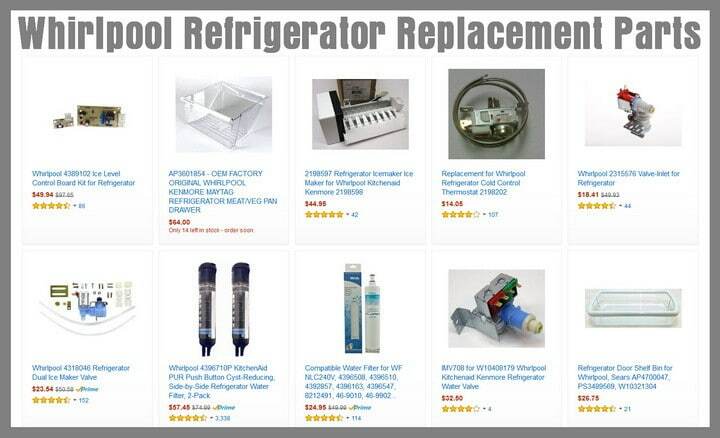 here are Whirlpool Refrigerator Replacement Parts for less. Condition: Freezer compartment thermistor failure Unplug the refrigerator and reconnect the freezer thermistor wire harness if loose. Check: Replace the wire harness if damaged. If the wire harness is okay, replace the freezer compartment thermistor. Check: Unplug the refrigerator and check the wire harness connections on the user interface control and the main control board. Reconnect any loose wires. If the wire harness connections are okay, replace the user interface control. If the problem persists, replace the main control board. Check: Make sure that the refrigerator power cord is plugged into the electrical outlet securely. The over-temperature condition is usually caused by a power failure. Part or Parts: Press the freezer temperature keypad to reset the freezer temperature display once the freezer cools to its normal temperature. Do you know of any other Whirlpool refrigerator error codes we have not mentioned or are you having trouble with your Whirlpool fridge? Please leave a question or comment below and we can assist. My Whirlpool FF-250 Elite refrigerator is giving alarm (for malfunction and not the door open alarm), showing ‘bo’ in the display. It isn’t cooling also. What could be the error. Refrigerator compressor stops working after every 8 hours and alarm light starts blinking. Need to on & off power button to re-start the compressor. My Whirlpool refrigerator has PO error code. The electricity was off and it displays the code when it came on. How do I remove the code? Hello, my Whirlpool fridge, Model: GI7FVCXWY03 the freezer is not working. I’ve changed the main board but I don’t know how to set up the program since I can’t find out the button “door alarm”. Could you please instruct me? Thanks a lot. I found your article when trying to find some info about my fridge error. I am not able to find the fridge manual as it doesn’t have the sticker with the model so I was wondering if you may have any idea of what it’s going on. It may be a defrost problem within the refrigerator. Remove the contents of the freezer. Remove the back panel on the inside of the Whirlpool freezer. See if the coils have ice on them. If the coils are iced up, this prevents the flow of cold air into the fridge side, thus the freezer is working and not the fridge. Let the coils defrost overnight or use a hair dryer and melt the ice off. Once done put everything back. Pray it was a one time issue. If this happens again, you may have a defrost sensor issue and you will have to troubleshoot the issue further. Let us know if it happens again and we can research the issue for you and get your refrigerator working again. Thanks so much for your help. I’m gonna follow those steps. Let’s see if it’s just a one time issue… I’ll keep my fingers crossed and I’ll let you know! Thank you!!! The whirlpool fridge is flashing 0 for both the fridge and freezer. I have tried to unplug it and plug it back in after 5 minutes to reset it. That did not help. We have the 6th sense fridge freezer but the display is only showing a mumber 8 in the temperature location under the word freezer. What do you think the problem is and can I fix it or reset the display. None of the other buttons are responding except the light. I have two year old Whirlpool WBE33752NFCTS fridge freezer. It’s displaying an error on its Temp LED which I’ve identified as Error 6. I can’t manage to speak to an engineer on the phone – they just want a paid call out which I can’t afford at the moment. Every 8 hours my Whirlpool refrigerator elite 250 starts beeping alarm. After I press alarm reset, it shows error code 60 or bo. Beep stops after I power off and on. This repeats every 8 hours after power on. At which temperature should I set my Whirlpool refrigerator? The freezer is working properly but I don’t seem to get the right temperature for refrigerator. It is recommended to keep the refrigerator temperature at or below 40° F (4° C). If your refrigerator does not have a temperature indicator, use a refrigerator thermometer and put it in the fridge to be sure the setting is at the best temp. Wrx988sibe00 Whirlpool French door fridge/freezer door open light is flashing. Usually if door is open and when open door the light is solid. I tried disconnecting power for 5-10 mins. Went away for approx 5 minutes then started flashing again. Won’t let me use ice or water controls. I checked fridge door switches also when depressed interior lights go out which indicates to me that they’re functional. I have a whirlpool gold refrigerator with bottom drawer freezer and my display screen is blank. If I hit a button it lights up but doesn’t give me a code. It just lights everything on the screen up. WHIRLPOOL gold side by side keeps flashing 6 error code. Unplugged it for 15 min, didn’t help. Compressor is hot but not running. All fans are working. Should I replace a control board? If the Whirlpool refrigerator door was open for some time time, or you added warm food in it the display will flash 6. This should go away when the temperature gets back to normal. Give it a few hours and it should go away. what is the meaning of BO in whirlpool frost free ice magic front display panel model. I have a French door whirlpool refrigerator, the lights inside went out, and nothing sounds like it’s running. Unplugged and plugged back in and everything started working again. When lights were out 01 was flashing on door. What does this mean? Whirlpool Refrigerator Code 01 means = Check water dispenser. You refrigerator was most likely put into test mode by mistake. It may have been running through the test mode when you looked at the screen and it was flashing code 01. By unplugging your Whirlpool refrigerator, you reset it and it should be working properly now. My temperature is not displaying for freezer and constantly buzzing (like when door is left open) also triangle warning sign shown. Fridge temp also went up despite altering the temp setting to cool it. Googled to troubleshoot and followed suggestions to completely defrost. Was surprised how much ice had built up at back of freezer so defrosted and reset again. This seemed to work for a day or 2 but freezer temp not displayed and starting to buzz again with warning triangle displayed. Had my whirlpool 6th sense appliance 9 years. For the TRIANGLE to clear the freezer gets to -13 degrees C then the warning goes off. Take off the panel at the bottom rear to expose the compressor and fan. Next check inside the freezer. Is there ice at the bottom rear inside the freezer? If not, take the rear panels inside the freezer out. Is the evaporator (the mass of pipes) blocked with ice or is there no frosting or ice at all? Let us know what you find and we can direct you from there. I have a KitchenAid fridge KFIS25XVMS2 that I just replaced the controller board. I guess I have to program it. I saw your previous message and I got to the “PE” stage (there is a number after the “PE” (0-10 and right now it shows “0”). The code displayed is “000”. My serial number is KY4085817. It looks like the programming code has to be 3 digits as there are only 3 digits (000) showing on display. Which 3 digits go in there and how do I change the digits? Press the UR keypad or LR keypad to change the digit value. The decimal point indicates the selected digit. Press the UL keypad to select the next digit. Once you have the correct program code entered, press and hold the LL keypad until the program code starts flashing. I just figured this out. I followed the above instructions until I got to the “PE” programming stage. The buttons are difficult to ID if the display is out but I used the upper left button for “door alarm” and the lower left for “freezer temp”. I used the upper right to increase numbers and lower right to decrease numbers. The ID label with model number and serial number had a ” code” number which was 1813. I used as follows: “PE1 813” and viola!!! All is now working. I hope this helps someone as this info was very hard to find. I have a Kitchenaid side by side model # ksc24c8eyy01 that keeps displaying PO code. I know that whirlpool and kitchenaid are like models. When code displays it quits cooling…any advice? KitchenAid or Whirlpool Refrigerator = PO error code = Power Outage. The power outage indicator lets you know if the power supply to the refrigerator has been cut off and the freezer temperature has risen to 18°F. When power has been restored, PO will flash on the display screen and the Power Outage icon shows. When the indicator is on other control and dispenser functions are disabled until you confirm that you know of the power outage. To reset, press MEASURED FILL to reset the display screen to normal. Brand new refrigerator. Plugged it in and I have the same PO issue and pressing Measured Fill is not resetting the display screen. Any other ideas? My whirlpool fridge freezer gave a CF alarm I replaced the back PC board but still have the same fault alarm. CF error on the Whirlpool refrigerator means a Communications Failure. The back board and the front board are not able to communicate. Since the front board is displaying this error, its most likely the back board is at fault. If you have already replaced it… You may simply have a loose wire harness or similar. Do some troubleshooting to find the issue. My fridge is showing “e” on the control panel, nothing else. Fridge runs well, I think. When I open the door panel works again for a while then starts to show “e” again. I don’t know what it means, can you help? If you have a Whirlpool refrigerator, the E error is not listed as an error or fault code. The errors for Whirlpool refrigerators will be D, C, and CF. Are you sure it is an E error or could it be something else? Is your fridge Whirlpool or another brand? I don’t know what else this could mean.. Also, it shows: e; Not: E. right in the middle of the screen, and nothing else. But the fridge is running, doesn’t seem to have a problem. Maybe the screen has a problem? But then again, why would it show a small e, and why does everything (temperature etc.) come back for a while after I open the door? Is it F or CF? There is no error code for F on Whirlpool in the error database. If we had to guess, the refrigerator is telling you to CHANGE THE WATER FILTER. I have a whirlpool side by side model B22CT80SN501 I just plugged it in for the first time and I have a PE showing in freezer temp and none of the controls do anything. Refrigerator does not run. This MAY mean the control board has not been programmed. Did you recently replace the board or is it a new fridge? 5 – The control should display PE to indicate you are in the programming mode. 6 – Entry is confirmed by pressing the freezer temp down pad once more. 7 – The control should display the current code. Your code is on the serial # XXXXX. NOTE: If the correct code is not displayed then you will have to change the code. 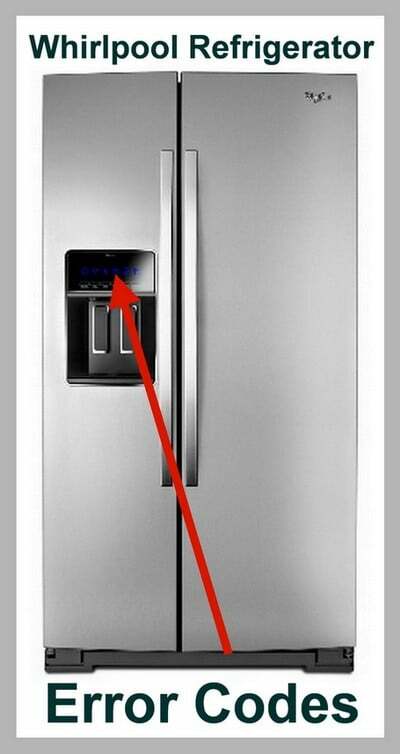 If the correct code is displayed, simply open the refrigerator door and the control will reboot. I did everything on my Whirlpool Gold Refrigerator, put in the code and nothing, i open doors and still nothing. The two internal lights fridge and freezer went out and the control panel as well, none of the dispensers are working there are no codes on the panel only a – in the window where freezer temp is displayed nothing on the control panel appears to be working. Power is on. Could be a board issue, possibly a bad cap or short on the board is causing the issue and not supplying power to lights or the dispenser. Does the fridge and freezer cool? Are lights burnt out in fridge freezer? Do the fans operate? Compressor coming on? Please describe in detail.